As the Spokane Transit Authority fights to convince voters to approve a 3/10ths-of-a-cent sales tax increase on the April 28 ballot, it's turned at least one prominent critic into an important ally. Last year, the STA Plaza became a lightning rod for some downtown businesses, which complained that the Plaza had attracted loiterers who blocked sidewalks, intimidated pedestrians and made trouble for downtown businesses. The critiques were intense enough for STA to pause its Plaza renovations for three months while the Downtown Spokane Partnership, Greater Spokane Inc. and Visit Spokane developed recommendations for the transit agency. For STA, it may have been worth the wait. Last Tuesday, the DSP board voted unanimously to support STA's ballot measure. 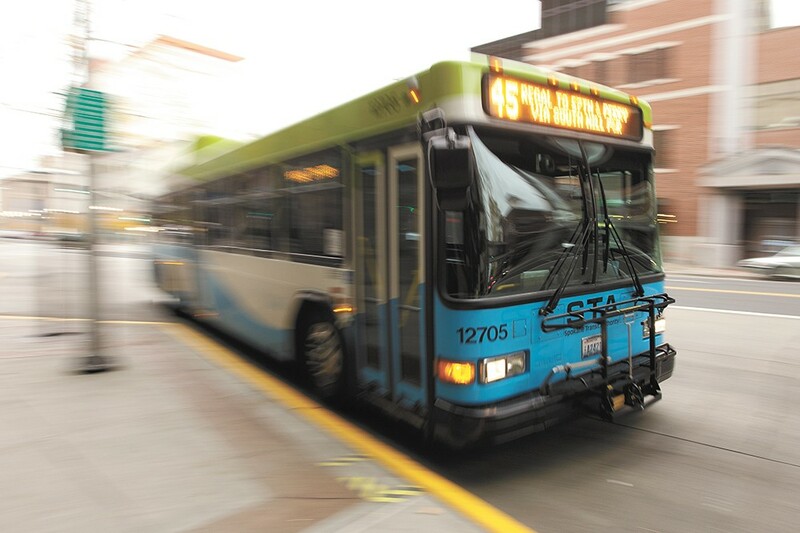 "There was a lot of education about how the ballot measure would actually pull buses downtown away from the Plaza," says City Councilwoman Amber Waldref, who serves on both the STA and DSP boards. It would mean faster passenger boarding and more direct, high-frequency routes. STA's "Moving Forward" plan, in fact, was exactly what some downtown businesses wanted to reduce the crowded sidewalks and Plaza loitering. Waldref's reasons for support are far broader. "For me, it's about the economic future," she says. "I firmly believe that investing in transit is going to have a huge return for the economy." Not everyone buys that argument. Greater Spokane Inc. declined to take a stand on the measure, and several conservative politicians have come out against it. Unlike last year's vote to fund streets and parks, this measure comes with a true tax increase. And in Spokane County, a tax increase is always a tough sell. At a transit forum in Spokane Valley, STA CEO Susan Meyer once again lays out the agency's long history and ambitious plans. "There has to be additional revenue," she warns, "or we won't be able to continue with this level of service." About 45 percent of the sales tax increase would simply go to keeping the status quo, replacing aging buses to maintain existing routes. The rest would go to dozens of improvements that bus riders have clamored for. Existing routes, like Wellesley Avenue and Indian Trail, would be upgraded with more frequency and longer hours. New direct routes, like one between Greenacres and the Spokane Valley Mall, would be created. Sleek new park-and-ride transit centers would be built, like one on the West Plains allowing direct service between Airway Heights, Medical Lake and Cheney. And that's just for starters. "We're extending Saturday night bus service past 11 pm. That's a big deal," Meyer says. "[Currently] if you go to a show downtown and you can't get on the 10 o'clock bus, then you're stuck." The Spokane Home Builders Association, major local political players, praises those improvements, but objects to the flashiest piece of the proposal: the Central City Line. The high-frequency bus route would stretch from Browne's Addition through downtown and to Spokane Community College. Boarding — riders would prepay at the station, and board using all doors — would be far faster, and buses would depart every 10 minutes. Initially, the line was proposed as an electric trolley-style bus, running on overhead wires. Other cities have seen economic investment spring up alongside light rail tracks, and STA hoped that a cheaper alternative would produce similar results. But when the cost of the overhead-wire design proved too pricey, STA shifted, instead proposing using electric charging stations on either end. The design, more electric bus than trolley, would still be eligible for federal grant dollars. Conventional buses, while cheaper, wouldn't. All in all, STA estimates that local sales tax will only need to pay for $12.2 million out of the Central City Line's $72 million construction cost. Depending on federal and state funding, that total may be even lower. In December, ECONorthwest came out with a sprawling 173-page report, estimating that the Central City Line could still improve the surrounding land and property by more than $175 million. Chris Cargill of the conservative Washington Policy Center doesn't believe that. The WPC calls the STA one of "the state's best managed public transit agencies," noting its low per-rider costs. But Cargill is skeptical of the Central City Line, arguing that zoning changes and incentives, not streetcar and light rail lines, moved investment to the regions STA has studied. The operational cost of $4.1 million a year for the Central City Line, he suggests, is steep. "[The measure] would bring Spokane sales tax to one of the highest figures in the state," Cargill says, for a transit system used by only a fraction of Spokane residents. On the Spokane City Council, the support for STA's measure is nearly unanimous. Among Spokane County Commissioners, all business-friendly conservatives, it's a rare instance of division. Commissioner Shelly O'Quinn was the only STA board member to oppose both STA's "Moving Forward" plan and the ballot measure. Commissioner Al French, by contrast, has championed STA for more than a decade, arguing that keeping young people in the region depends on a thriving transit system. County Commissioner Todd Mielke says that French has been opposed to the county taking a stance. "Al has a very strong resistance to doing that because it will be a 2 to 1 vote," he says. Like O'Quinn, he's a skeptic. As a dollar figure, the 3/10ths-of-a-cent sales tax increase is minor: On a $30 restaurant meal, that's less than a dime. But as a total amount, that's $270 million over 10 years. For STA, it's a massive 50 percent sales tax revenue increase. "No other government entity has ever asked for that big of a tax hike!" Mielke says. He looks at the county's aging jail and county parks, and sees plenty else that could use the extra revenue. Is the Central City Line really necessary? "We've got to avoid being the crow going after the bright, shiny objects," Mielke says. Mielke's opposition is shared in tax-averse Spokane Valley. Spokane Valley City Councilmember Ed Pace voted for STA's "Moving Forward" plan as an STA board member, but voted no on the tax increase. "It doesn't seem right that the Central City Line should be paid for by every sales tax payer around the county," Pace says at the transit forum. "The city of Spokane should pay for that, because it's mainly going to benefit them." But STA counters, pointing out that the plan would greatly expand the Valley's Mirabeau Point Park and Ride and would improve bus shelters along the Sprague route. Combine just those two, and that's about the local cost of building the Central City Line. Yes, the entire region pays for the proposal, but everyone benefits.